What will the future of cities look like? How can we improve urban design? For this challenge my team focused on water quality concerns. How might we improve water safety for citizens with suspect water quality? Unsafe water is still a major health risk world wide. People want agile, alternative methods to monitor water, especially in regions where the government is viewed as unreliable. Flint Michigan 2014-2016 water crisis resulted 100,000 residents who were potentially exposed to high levels of lead in their drinking water. 1 billion people in the world draw water from unsafe sources. This project highlights collaboration with a design team to create hero flows, application maps, UI specs and wireframes. Aquafar uses smartphones to track water quality and safety tests, conduct your own experiments and share data to other concerned citizens. It enables users to advocate for better water quality, make informed choices and verify municipal reports. Aquafar works with a microscope attachment to create real time water testing for pathogens. are empowered to monitor their own water quality and share the results making a safer city for all users through the Aquafar app. get information from both certified experts and citizen scientists, and can easy check and track the safety of their local water when traveling or in regions with poor infrastructure. like municipal workers, have an easy way to share water quality testing and crowdsource tests to learn of areas of concern through the app's detailed analytics. We generated 32 idea sketches on managing water quality issues in urban environments. Concepts included infrastructure designs, water conservation, and flood management. The ideas ranged from very speculative to very simple. We pinned up all these ideas and discussed the merits of each concept. We selected three ideas we believed were compelling enough to explore further. From these concepts we generated storyboards. We tested paper prototypes of our 3 most compelling designs for feasibility, desirability and usability with 3 potential users. The tests required each participant to complete a series of tasks and we concluded with interviews. After mapping the basic flows and architecture we started generating simplified screen in Sketch. Then we created an Invision click through to explore the flow and architecture of our app visually. We used this wire frame to test and ideate on the product. Throughout the generative process we struggled to understand what was possible in a consumer facing product. Would an app that rated the taste of water change behavior in a positive way or promote bottled water and waste? Was helping people make more informed decisions enough? What are the risks when you have water near a phone? Could we affect infrastructure where most of the waste occurs? 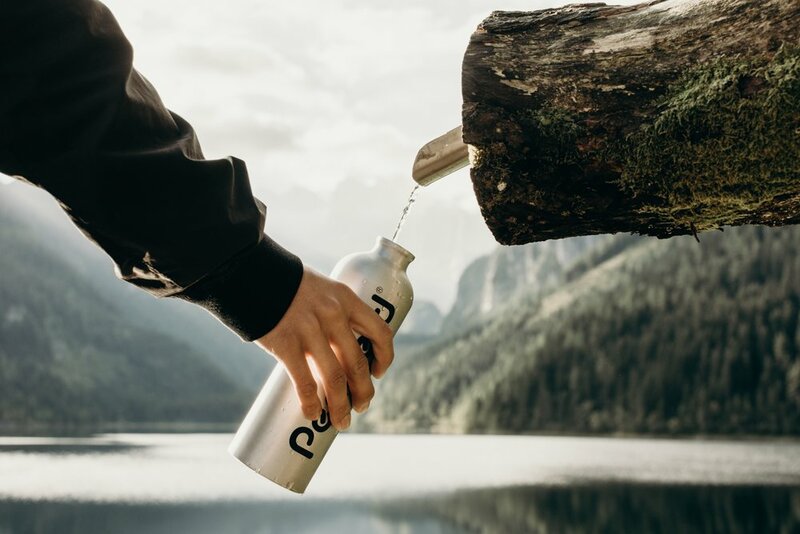 Through a series of long conversations we decided to focus on water testing for travelers and people living in countries that lack the governmental infrastructure to monitor water. Leapfrogging is the concept that countries can move rapidly from poorly-developed technology to modern systems with agile agile technology. We believe that water testing is an area where rapid adoption could be possible because the incentives for safer water are so high. The original design showed a world map marking where the user had traveled. We learned through testing that a more local map, like those used by a ridesharing app, was more appropriate for a location-based service. We decided to make that the homepage to reduce barriers to entry. Trusting a water test with a smartphone microscope was an issue for some users. So, we added an expert filter that incorporated expert tests. We also added a reminder that some bacteria in water was healthy. We did not want to scare people. Scientists and community stakeholders wanted the data on crowdsourced water tests. So, we added a feature that allowed approved users to gather data in order to analyze patterns in water safety and quality. We debated feasibility. Currently, a system like this would not be able to identify most pathogens, but through an interview with a Microbiologist we learned that there was a strategy forward based on the size of Giardia. See UI Specs for wire-flows and details. On the homepage of the app the user would be able to see expert and novice water tests in the chosen area. They would also be able to look into the results of these tests. The travel would receive information based on gps data about the safety of local water and relevant concerns, such as monsoons affecting water safety. The user could also learn some basic information about the country and water infrastructure. What I loved: This project addressed important issues that are real challenges for many people in different parts of the world. We explored how technology can democratize seemingly complex processes. I learned a lot about interaction design and to practiced classic design techniques like wireframes, application maps and affinity diagrams. We practiced team dynamics, working with other designers and creating buy-in from key stakeholders. The project fit well with my interests in sustainable design and solving problems with diverse populations. What I would do differently next time: This was a classic example of trying to do too much in our design and needing to narrow scope. Our app included a flow that ranked water taste which would have been better served as a separate tool for a different population. We struggled to define our keys population until very late in the process and did not get to do as many interviews or research as we would have liked.